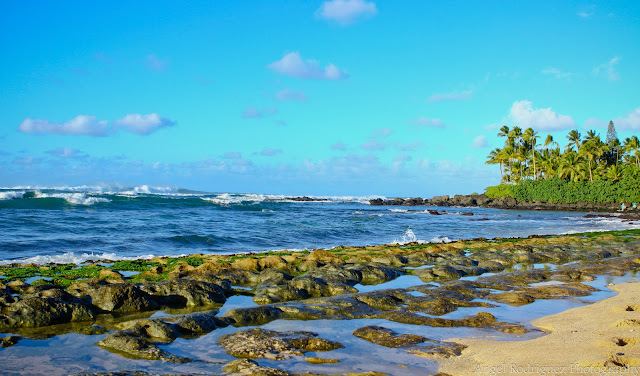 Laniakea Beach, or Turtle Beach" is a beautiful beach located on the North Shore of Hawai'i. It is also known for its visitor, the endangered green sea turtle! They come ashore to soak in the hot sun and feed on the seaweed that grows on the rocks. We got lucky and were able to see two when we went :) They don't do much lol but they are a sight to see. I know that back on the continental US it's still winter but, I am crushing on one piece swim suits!! You men may not agree but there's something about them that I love! I felt so classic in this little outfit and I can't wait for the Summer so I can wear it again!